Conventional, also called ‘authoritarian’, learning and development philosophies are usually based on the idea that a learner is a ‘tabula rasa’ or clean slate onto which knowledge must be transferred. Learners are empty vessels into which the expert can pour information. In contrast, contemporary inclusive learning models view learners as participants rich with a personal body of knowledge acquired through experiences within unique contexts. Coaching and facilitation are processes that have developed out of these models, but are often still plagued by remnants of the transmission models of learning. Coaching-facilitation is a conversation not a monologue: for us, learning and development is no longer a top-down, one-way process, but rather a dialogical interaction between equal partners: facilitator-participant and participant- participant. Your expertise, therefore, lies in how well you can allow everyone to listen to a multiplicity of divergent ideas in one conversation, not in how well you get everyone to agree with your opinion. Delegates, not the agenda, need to drive the process: Where conventional methods assume that there is a notional ‘average delegate’ at which training should be aimed and who determines the standard, we believe that no such assumptions can be made. Rather, a systemic map must be created of participants’ needs and expectations and the facilitator’s own needs and expectations must be articulated. This is not a once-off occurrence, but happens continuously throughout the process. The process is driven by difference not sameness: In other words, participants do not form a more-or-less homogenous group where those who differ from the group can be categorised as ‘other.’ Rather, all people differ from one another and these differences are fundamental to our planning, processing and provision. Coaching-facilitation is more listening and responding than talking and controlling: As inclusive coach-facilitators the focus of our processes is not on content that needs transmission, and our role is not to control the outcome of the process. Rather, our focus is on the delegates with their experience, and our role is to facilitate the dialogue between the intention of the process (which may include information sharing) and the delegate. We become mediators of knowledge, not mere transmitters of it. Coaching-facilitation is creating experience, not merely transmitting information: Our workshop materials are therefore not mere extensions of a trainer, like a slide projector, transmitting information while learners participate mainly by looking (reading) and listening. Our materials, and indeed our entire methodology, aim to create or draw on experience where participants can take part with as many faculties as possible. 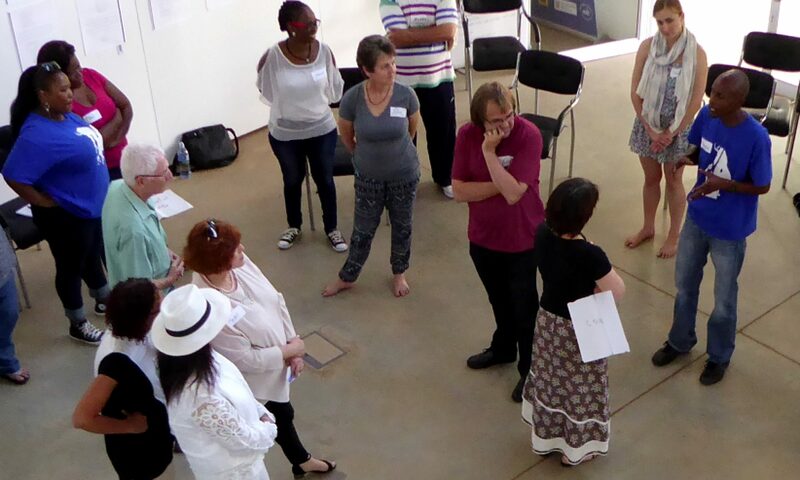 It is a whole-brain, whole-body approach that allows delegates to take part in the meaning making. Relevance is more important than accuracy: In our sessions we value not so much questions relating to the material, but rather questions relating to the relevance of the learning for each delegate’s individual role and personal journey. There is more than one kind of knowledge: In our processes there is not just the coach-facilitator’s knowledge in the room, but also the tacit knowledge participants carry in their bodies and the group genius that arises from the collaboration between participants as they work to interpret and apply knowledge. Action and implementation speak louder than words and learned answers: The responsibility and ownership of the learning becomes that of the facilitator and the delegates alike. Assessment then focuses not on the reproduction of knowledge taught, but on its integration and implementation in the workplace – not on words, but on action. Note: We acknowledge that some contexts ask for a certain amount of content as well as the accuracy of its application. 1+1=2 no matter how you look at it (or does it?). Still, we believe that information transmission, while it serves its purpose in many contexts, is overused and overvalued. This is especially true in situations where coach-facilitators and delegate-participants do not share the same frames of reference, so that much of the information that is being transmitted is lost in a fog of misunderstanding. Acting in a set context without the benefit of scripted words and only the tacit knowledge accumulated through experience is called improvisation – the central concept around which our training revolves. Improvisation also draws on the ability of a group to generate solutions together and use dialogue to drive the story, and indeed the learning, forward. Next PostNext How do I improve learning and development programmes?